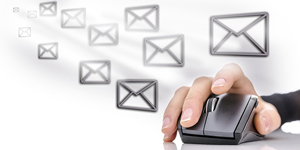 Triggered emails can be a great way to deliver the right content at the right time to the right people. A sincere thank you, a courteous confirmation, or a concerned abandoned cart message that automatically follows a specific behavior someone took on your website can be the difference between a very happy customer and losing a contact altogether. 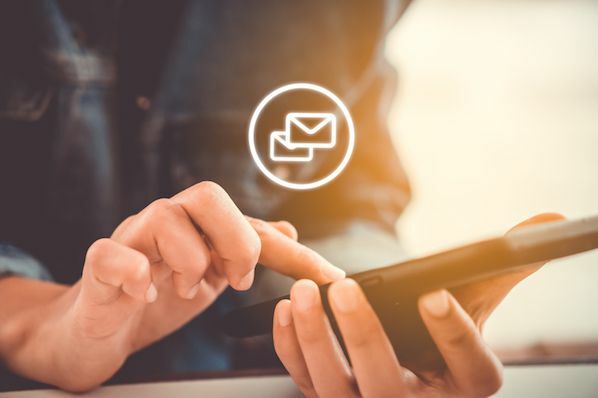 As long as the automated email is relevant, timely, and provides value to the recipient, triggered emails can be used to save marketers a tremendous amount of time and, more importantly, better engage your contact database. 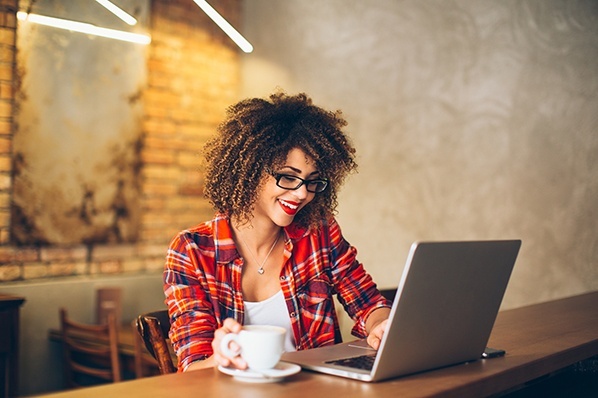 Take a look at the examples below for some ideas of triggered emails you can incorporate into your own email marketing campaigns. Uber sends an automated welcome email to anyone who registers for their services. The welcome email is simple and straightforward, welcoming new users and thanking them for signing up for Uber. To assist the new users and to encourage them to actually start using the car service, the welcome email also explains how Uber works in three simple steps, followed by a few tips on getting started with Uber. We love how Uber capitalizes on this opportunity to further educate their users. 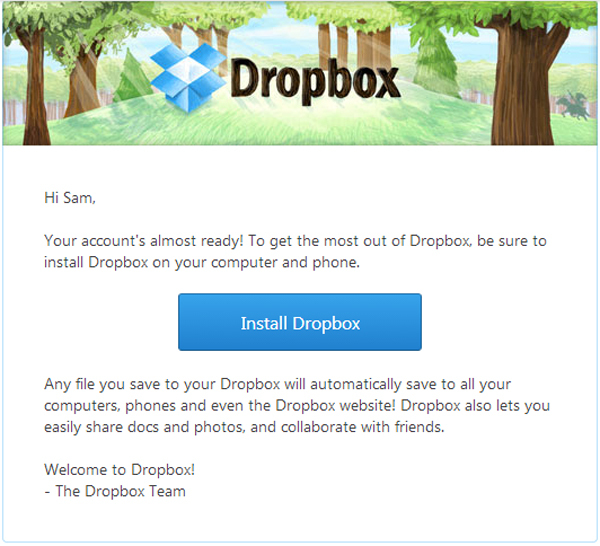 Dropbox uses a triggered email to re-engage people who signed up for Dropbox, but have not actually installed the software on their computers yet. The first great thing about this email is it uses personalization tokes to address the recipient directly, using his first name. The body of the email is very brief, which is nice. The text identifies a few specific ways Dropbox can assist you in organizing your files and a large blue CTA is noticably positioned directly in the middle of the email. It's short, sweet, yet still informative -- exactly what people in a re-engagement campaign need. ModCloth sends this email to people who have been subscribed to ModCloth’s email list for six months to celebrate their “anniversary” together. Of course, the true purpose of this email is to drive contacts back to their website -- and maybe make a purchase. 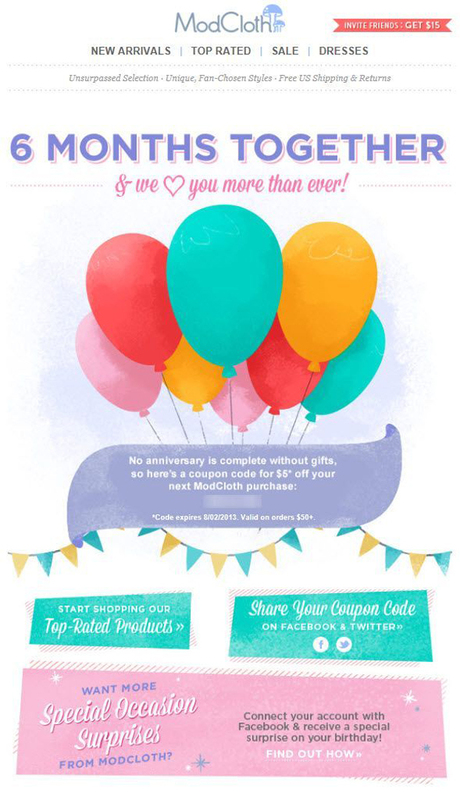 To encourage recipients to visit ModCloth’s site and make a purchase, the anniversary email offers a coupon code for $5 off the contact’s next purchase. It's a small thing for ModCloth to give up in exchange for repeat business. Amazon uses this triggered thank-you email to drive customers back to their site and gain information about the consumer that can be used to suggest additional products in the future. In addition to thanking the customer for their recent purchase and personalizing the message using the consumer's full name, the email also asks the recipient to review their new product. And chances are, people are only going to review products they feel strongly about. 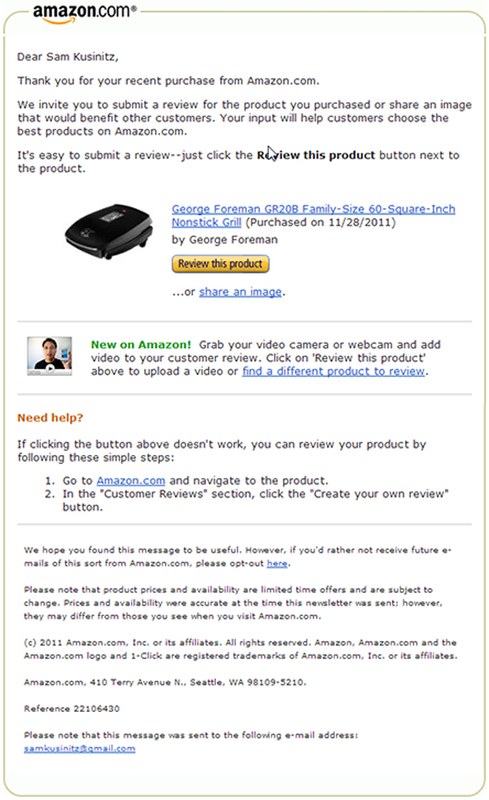 Based on the products they review and how they review the product, Amazon can show them products they may like in the future. Plus, if the person ends up leaving a review, it could convince someone else to buy that product, too. No one likes waiting day after day for a package arrive, wondering whether or not the item was ever actually shipped. To quell unnecessary anxiety, Zappos sends an automated email to customers as soon as their package is shipped. 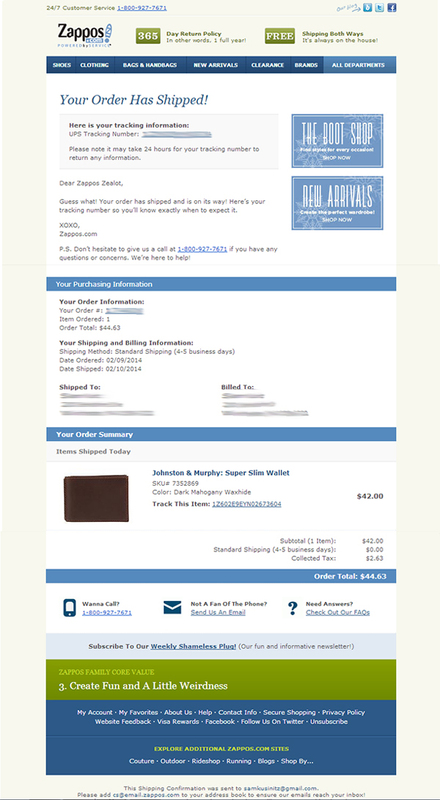 The email is personalized as it provides a picture of the specific item(s) the consumer purchased as well as the shipping address, a link to the order information, and the anticipated delivery date. As the bottom of the email states, one of the core values at Zappos is to “create fun and a little weirdness." The email clearly adheres to this value addressing the recipient as “Zappos Zealot” and closing the intro to the email with “XOXO, Zappos.com." Urban Outfitters automatically sends this email to people when they request to unsubscribe from the clothing store’s emails. The purpose of this automated email is a last-ditch effort to convince recipients not to unsubscribe. To appeal to their young adult target audience, this email creatively plays on the idea of a salvaging a relationship. 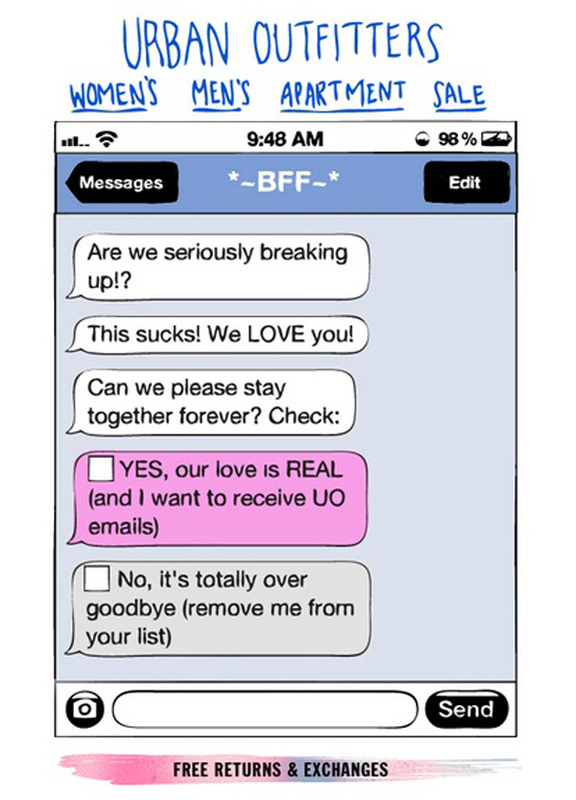 Rather than simply providing a checkbox to either confirm the unsubscribe request or remain on UO’s email list, this email features an amusing image of a text messaging conversation that expresses Urban Outfitter’s desire to avoid “breaking up” with the recipient who is shown as contact “BFF” on the mobile phone. We love how this email is something that their buyer persona can definitely relate to. What other companies have great triggered emails? Share your favorites with us in the comments!